"Written with the simple authority of an oral deposition, packing the punch of All Quiet on the Western Front, this is both a resolutely nonpartisan anti-revolutionary brief and a gripping, harrowing story of personal courage and endurance." Horrible as it is, you don't want to turn away from the girl's first-person nightmare. The language in The Bathhouse is simple, the dialogue taut, the tension immediate." "Even as the prison strips away all hope, Moshiri never once lets us forget the humanity of the women of The Bathhouse as they form a family, with all of a family's capacity for support, betrayal, despair, and dignity. The Bathhouse is beautiful and excruciating, written with such grace that it seems to exist out of time." "A gut-wrenching, eye-opening novel. The Bathhouse shows what happens when ideology runs amok. It honors the humanity and sacrifice of the victims." Farnoosh Moshiri's The Bathhouse is a chilling and strikingly moving narrative of a girl haphazardly caught in the claws of an extremist political regime. The novel introduces a seventeen-year-old high school graduate in Iran in the early 1980's, as Ayatollah Khomeini's Shiite Revolution began to grow in authoritarian power. One late August evening, the girl is arrested at her home along with her politically active brother and sister-in-law and imprisoned in a former bathhouse. The girl, who remains nameless throughout the narrative, suffers captivity and torture reserved for political prisoners, while developing subtle, complex relationships to other prisoners and even prison staff. The novel is removed from particular issues of politics and instead focuses on the girl's experience in prison. Her story is told in simple, journalistic prose, thus making the book both compelling and personal. Riveting and shocking, this powerful story also offers the reader an inspirational tale of courage and survival. 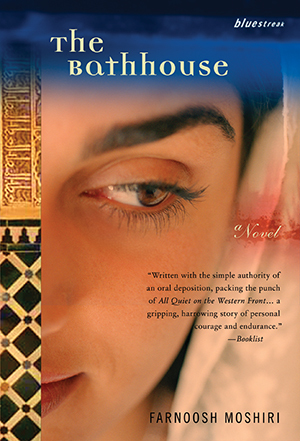 Born into an Iranian literary family, Farnoosh Moshiri received her Master's degree in drama from the University of Iowa in 1979, then returned to Iran. In 1983 she was one of a group of actors and playwrights who were ordered to sign an agreement to obey the dictates of the new regime. They refused. Moshiri went underground, eventually escaping with her infant son to Afghanistan, then to India where she wrote in a closet, the only place she could find privacy in the one-room flat she shared with other refugees. She has lived in Houston since 1987 and is a graduate of the University of Houston's creative writing program. Currently, she teaches at Montgomery College in Houston. Her first novel At the Wall of the Almighty (Interlink, 1999) was well reviewed, and her second novel, The Bathhouse (published in hardcover 2001, Black Heron Press), received the Black Heron Press award for social fiction. I was born under the sign of the scorpion, on July 14, 1951Bastille Day. When my mother was in labor in a hot hospital room in the center of Tehran, thousands of Iranians were demonstrating behind the tall, ivy-covered walls of the hospital. They shouted slogans in support of the popular prime minister, Mohammad Mosadeq, and his plans for nationalization of oil. British imperialism was pumping out the major wealth of our country. My family members were among the modern intelligentsia who supported the progressive prime minister. My father was a young Marxist writer, my uncle, a nationalist poet, and my grandfathers both were secular intellectuals, knowledgeable in Persian literature. My mother recalls that in the stormy days of the oil dispute she, my father, and my uncle were among thousands of young activists, who on bicycles or on foot waved the flags of freedom and democracy in the streets of Tehran. Two years later, in August 1953, the CIA operated a bloody coup d'etat in Iran under the code name of T P Ajax (a code for a succession of CIA plots to foment coups and destabilize governments). As a result, the elected Prime Minister Mosadeq's government (he had 99.9% of the people's vote) was toppled and he was arrested. The Shah, who had fled to Rome, was sent back to Iran to form a new dictatorship under the guidance of the United States. The 1953 coup was bloody and ruthless. Armed soldiers stood in trucks and shot at people; nationalists and Marxists were arrested and tortured in the Shah's prison. Soon, the CIA and MOSAD, the Israeli intelligence service, created a secret police agency by the name of SAVAK for the Shah's government. This organization became notorious for the persecution, torture and execution of free thinkers. In the oil dispute with the British, Iran came out a loser. In a nominal nationalization of oil Iran received 50 percent of the profits, but the international sales remained in the hands of foreignersBritain had 40 percent, US companies had 40 percent and Dutch and French companies the rest. The hopes of millions of Iranians to control their own national resource were buried for another quarter century, when history repeated itself in a different disguise. Twenty-six years after the CIA coup, in February 1979 a revolution happened in Iran that, according to some historians, was comparable to the French and Russian revolutions. Millions of people demanded that the Shah's dictatorship end and a new republic begin. Religious and secular parties, liberals, nationalists and a variety of Marxist organizations all struggled to reach the masses. Twenty-six years of suppression and imperialist intervention had led to an eruption. The pressure pot exploded. When the revolution happened I was a graduate student of drama at the University of Iowa, finishing up my last semester. Ironically, my final project was about Bertolt Brecht's last play, Galileo. In this play, the Vatican's Inquisition forces Galileo to repent and take back his scientific remark that the earth is a planet and rotates around the sun. By displaying the instrument of torture the monks force the scientist to announce that the Vatican is the center of the universe and the sun rotates around the earth. When I studied and analyzed this play, I was not aware that what I'd chosen for my final project foreshadowed strange incidents that would soon happen in my country and would change my destiny. In May 1979, excited by the news of the revolution, I skipped the graduation ceremony and fled to Iran. I wanted to be part of this massive uprising and with my fellow country people struggling to achieve the long delayed freedom and independence. I arrived a few months after the first revolutionary riots. The Shah had already fled the country and Iran had an interim government. The political atmosphere was extremely open and Iranians enjoyed immense freedomsomething they had never experienced before. I recall hundreds of demonstrations and rallies every day by different political organizations, young men and women passing out flyers, old and young carrying on fervent political debates in public places, and an unprecedented solidarity and brotherhood in spite of differences of ideology. People partied on rooftops every night and discussed the future of the revolution. But between 1979 and 1983, when the political power fell completely into the hands of the Islamic clergy and the last political party was shut down and its members imprisoned, the young revolution went through a massive transformation. This change buried the hopes of the nationalists, liberals and Marxists. Some believe that the revolution (the fundamental change of the country's social and economic system) failed. The religious fundamentalists under the leadership of Ayatollah Khomeini created a blood bath, which resulted in the execution of thousands of Iranians who were labeled enemies of God. According to the new imposed ideology, I was considered an enemy of God. I was a professor of playwriting and dramatic literature and a dramaturg (drama advisor) for the Theater Division of the Ministry of Culture and Art (soon to change its name to the Ministry of Islamic Guidance). I had been a ballerina in my younger years and pictures of me in a tutu dancing on the stage of the opera house still existed in the albums of the Ministry. These albums along with ballet costumes, stage props, musical instruments, and a film archive were burned by the Party of God as "satanic objects." I ran the literary page of a progressive newspaper and was a member of The Council of the Writers and Artists of Iran. I participated in political and cultural activities and collaborated with a feminist group in the Women's Organization. When the "turn to the right" happened, the Islamic agents began to interrogate the secular intellectuals in all the organizations. A process of purge began. I remember the day that I was teaching playwriting to a small group of women in a workshop that the Ministry had assigned me to teach. An hour after the class, armed guards broke through the classroom door and pointed their machine guns toward us. They ordered us to move back and face the wall. Then they began to search the class. We were studying a few American and European plays, among which, as I recall, were plays by Tennessee Williams and Arthur Miller. The guards collected the books and papers and told us that these were "communist documents." Spontaneous executions were happening here and there and I thought that while we were facing the white wall the guards would shoot us. But one of the students who wore a scarf (the rest of us hadn't covered our hair) was allowed to talk. She said that her fiancé was a revolutionary guard and she herself belonged to the Islamic Party. She saved our lives by convincing the ignorant guards that the papers and books were not "communist material," but texts of drama. Less than a month after this incident I was teaching history of theatre in a sunny classroom of the college of Dramatic Arts, when through the open window I saw the bearded agents driving into the courtyard with their black vans. Soon all the classes were cancelled and the guards took us in the vans to the former Rudaki Hall, Tehran's magnificent opera house which now served as a mass prayer house; they ordered us to sit on the marble floor of the lobby and fill out stacks of forms. These forms were basically religious questionnaires that inquired about the theological knowledge of the employees and asked them to cooperate with the regime and follow the Islamic rules. I remember that Mr. J., a veteran actor and activist, first rose up and left the hall. Following him, the rest of the professors walked out and left the forms blank. Along with many of my colleagues I was fired from both of my jobs. The newspaper for which I worked was closed as well. This was the winter of 1983, when my first full-length play was getting ready for the stage. The rehearsals were held in the building of The Council of the Writers and Artists and my former drama professor and friend was hoping to produce it for a major stage. But after the purge of the secular artists and writers from cultural organizations the guards locked and sealed The Council and arrested a number of members, including my director and the actors. This marked the end of my career as an Iranian playwright. Now the clock ticked, as if in a count down. Each day more and more of us, "the others"those who didn't want to join the Army of Allahwere arrested. There were also rumors that the prisoners were tortured in Evin, the central prison of the republic. This horrible, modern facility was handed down to Khomeini's regime by SAVAK. Some of the Shah's SAVAK agents had grown beards and become members of the Party of God; they tortured the political prisoners with savage classical methods and the new "Islamic" ones. Soon reality put an end to the rumors. The nightly TV shows of repentance began and this proved that the political prisoners were forced to repent and join the Party of Allah. Scientists, writers, historians, liberal and Marxist political leaders under severe psychological and physical torture broke down and appeared in fuzzy videos confessing to their sins (the sin of having a different idea or religion). They announced their repentance and their acceptance of Islam. Their stony and sometimes badly bruised faces left no doubt to the viewers that these mature (some elderly) leaders had not voluntarily appeared in front of the camera. What happened was amazingly similar to the Medieval Inquisition; new Galileos were forced to lie and announce that a religious belief was the center of the universe. When Galileo Galilei broke, his faithful student Andrea cried, "Unhappy is a land that breeds no hero!" Galileo murmured, "Unhappy is a land that needs a hero." Whether our generation of Iranian youth, who had witnessed a revolution's rise and fall, needed heroes or not, there were men and women who did not break and remained faithful to their ideas and principles. They chose to go to the "Wall of the Almighty" and die and not to repent. My close friend, a sociology professor, age thirty-eight, was among them. My youngest aunt, a philosophy student, age nineteen, was among them. My mother's cousin, a retired colonel, who had converted to the Baha'i religion was among them. My colleague, Mr. J, a sixty-five year old actor was among them. And hundreds of other men and women, who stood against the wall, raised their heads and chanted the song of freedom. A dark dictatorship, a religious fascism had opened its black wings over my country. One of the ugly peculiarities of this regime was a deep-rooted animosity toward freethinking women. Some women at the time of their executions were denied the right to stand on their feet next to their brothers. They were executed in tightly tied burlap sacks. This image haunted me and appeared in recurring nightmares for years, until finally I released myself from this horror by writing it as a scene at the end of my first novel, At the Wall of the Almighty. The imposition of a uniform consisting of a long dark colored overcoat and a large scarf was only one of the humiliating rules that were imposed on women. Women were forbidden to walk or to talk with men in public places or sit next to their male classmates in the universities; they were forbidden from certain occupations; they were arrested or even flogged openly in the streets for not having appropriate cover. Medieval means of punishment like stoning and amputation were practiced. Iranian women, historically, have been free-spirited, outspoken and socially aware. They participated in the Constitutional Revolution of 1905, when absolute monarchy changed to constitutional monarchy. They struggled for the nationalization of oil in the 50s; this was my mother's generation. In the 1979 revolution the number of female participants grew drastically. There was not a single family whose daughters were not participating in street riots along with their brothers. Besides justice for all, women demanded equal rights with men, but after the Islamic regime's "turn to the right" the clergy took away these rights, which women had recently obtained under the Shah. Many secular women opposed the humiliating rules of the new government and were arrested as a result of their protests. Even in the prison facilities women didn't have equal rights with their male prison mates; they were tortured more severely and executed more savagely. Virgins were raped before their execution and mothers and their children were separated. Children were used as a means of torture for the mothers and vise versa. Some women left the country; those who couldn't remained to fight for their freedom. Some showed their anger in self-destructive ways. I remember seeing the picture of a physician who burned herself in a public plaza as protest for the humiliation and suppression. She was in flames, a human torch. When my close friends, colleagues, and relatives were arrested in the massive roundup of 1983 and I had to go underground, I realized that it was necessary to leave the country. I had already lost my jobs and my name was black listed. Soon the guards would invade my home and take me to Evin with my two-year old son. It was my father who first suggested that I had to leave to save my baby's life. I remember the day that he walked to the neighborhood pharmacy, with his back slightly bent, as if it would never become straight again, and bought diapers and formula for his grandson. He packed my light knapsack while my mother cut my long hair for convenience. She thought that having short hair would make it easier for me to cross the border, but I thought that if the guards did arrest me now, or while crossing, they wouldn't be able to pull my hair or hang me from it. So in a dark night, holding my son on my back, I walked on minefields and followed the turbaned smugglers who led me out of my country. I left my homeland, my family, my art, and my identity behind, not knowing that I had to give birth to another self in a different life and build a new house and dwell in it for many years. Exile is the condition of being uprooted; it's an unhealable wound, a sadness that can never be surmounted. Exile is the condition of permanent loss. This is even more true for an exiled writer. She is cut from her land, her past, her heritage, and language. She has to overcome the crippling sorrow of estrangement and create a new self. The new environment, if not hostile, is indifferent to her. She has to build a home out of her own breath, out of her words and imagination. So writing becomes a safe new home and allows her to return to the old home. I began writing my first novel, At the Wall of the Almighty, in Houston, seven years after that voyage in the dark. My son and I had been living in refugee camps in Afghanistan and India where at times the only private place available to me to contemplate and write was a closet the size of a coffin. In the summer of 1987, as political refugees, we moved to Houston, where my sister lived. The first three years in America were as difficult as the "camp years"; they were years of struggle for survival and adjustment. I suffered unbearable linguistic block. I was a single mother with two degrees but no job, a writer who had lost her language, a playwright without a stage. It took me three years of agonizing writer's block and hard work to be able to switch my creative language into English and write short stories in my second language. An exiled writer works harder and never thinks about success. Exile teaches humility. The writer who once was known, read, and admired, is now a needle in that proverbial haystack. The exiled writer, in her new house of words, lives in constant fear of failure. But at the same time she possesses more resilience, the resilience necessary to oppose the corroding effects of uprooting and isolation. But not all of the exiled writers are able to build a new house out of their own words. Some remain homeless in the new land. I was among those who fought and won the battle. With my first stories I was admitted into the creative writing program of the University of Houston. But before taking any writing workshop my novel had started to write itself. It was a universe of mazes and we couldn't find a way out. When I began At the Wall of the Almighty I wanted my sociologist friend to be the protagonist. I wanted him to be the unbreakable man who under severe torture forgets his name, but does not repent. But as the novel progressed my character acquired his own identity and wrote his own past and present to the end. I wrote for four years without interruption and without thinking about publication or success. I showed the first twenty pages to a creative writing professor and read the horror in her face. She said, "How can one write about such a subject in such a matter of fact language?" After this reaction I decided not to workshop the novel anymore. I had fear that negative remarks would discourage me from continuing the novel. This novel was, after all, my long delayed therapy, the cure of my pains; it was the house I was building to live in; it was my new roots, if I had to grow roots in this land at all. How could I let people destroy it? So I finished the first draft and revised it many times and asked one close friend to read the manuscript. She was amazed and I dared to show it to more people. I remember an American writer friend who read the manuscript, rushed to my house and urged me to call his agent. When I showed hesitance he picked up the phone and dialed the agent's number in New York. It was then that I realized that the novel was publishable. But my friend was too excited and wrong and probably didn't know the market very well. No agent or publisher grabbed the novel excitedly. A few publishers sent me personal notes and admired the writing, but said that the subject was not marketable. It took me three years to find a publisher. Who was interested in what happened in a prison facility somewhere on the other side of the world? Americans wanted American novels, which spoke of their own lives, their families and their own happiness and unhappiness. Who cared who I was, how many borders I crossed, or why I had to write this novel? For At the Wall of the Almighty I had done some research and even talked to a few people who had managed to get out of Iran. Some of these documents were not used in the novel and one in particular tempted me to write something else. In the summer of 1996 I wrote The Bathhouse in forty days. The chap-book type memoir of a woman with the pen name, M. Raha (meaning free), who had been imprisoned but freed and now lived somewhere in Europe, helped me with the facts of this bathhouse, which was turned into a prison. My imagination created the setting and the characters and this particular seventeen-year old girl, whose life changes forever after spending a month in the nightmare of this bathhouse. It is true that seventeen year old girls, or even younger, were arrested for possessing only a pamphlet or reading a book, or simply having been a sister to an activist. It is true that virgins were raped so that they wouldn't go to heaven. Sitting in boxes for days, being flogged and stoned in public are all true incidents. Execution by mistake happened many times. Execution without trial was a common practice. In The Bathhouse I have told the tragic reality of a medieval regime, a twentieth century Inquisition and I have used my fictional imagination to give life to the characters. Those who resist and are executed, like Leila, the surgeon, and Hamid, the protagonist's brother, are representatives of all who died heroically in the "Bathhouses" of Iran-my aunt, my sociologist friend, Mr. J, and many others. This book is a tribute to them and dedicated to their memory.
? Or, sometimes I travel a lifetime back and ask: What if the United States and Britain hadn't destroyed a legitimate government in my country in 1953, which would have allowed my land to grow and prosper and would have allowed me to become a writer in my own home? Yes, what if and what if and what if. If there is any obsession, this is the one. Many specifics of The Bathhouse are left ambiguous: We do not know where The Bathhouse is, or have any sense of time, nor do we even know the narrator's name. How do these subtleties contribute to the mood of the book? "I felt worthless, ashamed of being in The Bathhouse only for writing stupid entries in my journals. I was no one, nothing, and I was being punished for my stupidity," says the unnamed girl narrator of the book. The girl watches many prisoners come to The Bathhouse and be executed for their beliefs. She, along with other relatives of political activists, was arrested for her family ties, not for her actions. How does she deal with her own lack of political action? Is she an example of strength, or is she a "spoiled brat", as Jamali calls her? In what ways does she show strength or courage? The girl narrator develops a familial relationship to several of the women in the camp. What do Zohre and her baby, Mrs. Moradi, Dr. Mina, Leila, Robab and Roya mean to and do for each other? Which cellmate do you most empathize with or relate to? In what way does the narrator reflect the different personalities of the other cellmates? In the last interaction between the narrator and her brother Hamid, he states, "I believe in my ideas. It's a war, you see? A war of ideas. They won, and they have the power. Had we won, we would have done the same thing to them." Do you believe Hamid's statement about the capacity for any group in power to inflict violence and injustice upon those they oppose? Do you think Moshiri would agree with Hamid's point? In prison, the narrator's pregnant sister-in-law, Ferial, switches sides and begins espousing the beliefs of the regime. Do you think the narrator forgives Ferial for repenting, as Hamid asks her to? Could you forgive Ferial? The narrator describes feeling peaceful and calm, and remains silent during some of the most disturbing periods of her imprisonment- after Leila and Hamid are executed, during her imprisonment in the cardboard box, and even as she is about to be mistakenly executed toward the end of the novel. Why do you think the narrator has these feelings at those tense and troubling moments? "I didn't smile at Ali. He was not a child. I didn't know what he was," says the girl narrator. Ali, the son of Jamali, appears several times throughout the novel. Subtly, the narrator's perception changes as she sees him, like herself, under Jamali's authority. Jamali tells him countless times not to associate with the prisoners; that his worth as a human is greater. Just before her release, however, the girl sees her and Ali's positions reversed: she sits on the floor, while he is punished by his father. What is Ali's significance to the story? How does the book expand your understanding of the political situation in Iran at this time? Why do you think the author chose to write about one individual's isolated experience, absent of specific political and geographical references, as opposed to a more deliberate political commentary about the Shiite Revolution? The narrator kept a journal prior to her imprisonment, and shared stories with her cellmates during their time at The Bathhouse. When she is released at the end, she wonders "What would I tell my sister when she asked, What happened in The Bathhouse?" Has her imprisonment affected her capacity to tell stories? Do you believe storytelling can heal? 1. What was the inspiration for this story? How does the story reflect your own experiences? The experiences of others? After the arrest, torture, and execution of Iranian intellectuals (some of whom were my close friends) in the early eighties I could not stay silent. As a writer in exile I began to reflect on the subject of prison and the predicament of political prisoners. I'd heard that many of the youth who were executed in the facilities of the Islamic fundamentalist regime of Iran had been arrested by mistake, or possessed only books or flyers. Many were still in high school when they were abducted and taken to prison. In At the Wall of the Almighty, my first novel, I wrote the story of a man who had been politically active in the revolution, but in The Bathhouse I chose to write from the perspective of one of those young girls, who were arrested for no reason. 2. You interviewed former political prisoners to construct the background for the story. In what other ways have former prisoners found the voice to tell their stories? I talked with a few people who had been released and I read the memoir of two women who had been in prison for a few years. I learned about the atmosphere of these facilities and the torture techniques by reading these memoirs. I imagined the rest and created the story line. The protagonist of The Bathhouse is not based on a specific person, but she is modeled on many girls, who were very young and were arrested. The prison transformed them. Some of these girls broke, repented and became agents of the government; some lost their sanity in the prison, and some survived to tell us what happened. There were a few who acted heroically to the end. 3. Your two most recent novels, The Bathhouse and At the Wall of the Almighty, are written in English. How does writing in a language other than your own affect your writing? I've known English since early childhood, so transition from Farsi (a Persian language) to English, as a creative language, did not seem impossible. I'm not saying it was easy; I worked hard and willed it to happen. I knew English well enough, could read literature and had a degree from an American university, but to be able to think in this language and write fiction was a challenge that I decided to take. I had no alternative. I wasn't a tourist here. The bridges were burned behind me and as a writer I needed readers. I didn't want to write for the Iranian community; most of them knew the stories I was telling. I wanted to address the American people. Besides, there were great role models for me in literature; writers like Conrad and Nabokov had done this before. Now English is my creative language, I love it, and I'm comfortable with it. Since I've learned this language through serious literature I'm less likely to use clichés and other forms of "bad writing" that native writers are prone to. 4. How does writing for an American audience influence your work? When I write, I always have American readers in mind. My American reader is the intelligent, compassionate, open-minded, peace loving American. She is not necessarily very educated, but she loves to read serious literature and has a thirst to know about other cultures; she wants to educate herself in ways other than the standard ones. She is a political animal and wants to know what American schools and media do not tell her. This imaginary reader helps me when I write. Fortunately, I've had an opportunity to meet some of these men and women in person at my readings. Their support and true human compassion (which is different from patronizing a Middle Eastern refugee) encourage me to write more. 5. How does the narrator's gender influence her story and experiences? Of course the predicaments of a young man would be very different. Women in Islamic fundamentalist regimes suffer more than men. This particular interpretation of Islam is extremely misogynistic. We recently saw the most severe example of such interpretation and behavior in Afghanistan. The Bathhouse begins with the narrator menstruating, while the guards are taking her to prison. The bleeding cycle gives the novel unity. She is bleeding again when they release her. All through the time I was writing this book, which was forty days, I was in the skin of a seventeen-year old. How does a seventeen-year old girl react when she is in the hands of the authorities, who do not believe women have the same rights as men? How does she react when she witnesses all this cruelty? 6. Given your political views, why did you choose to write a story that left the historical and political details of the Shiite Revolution largely unexplained, focusing instead on one girl's experiences? The 1979 revolution in Iran was not a "Shiite revolution" when it happened. There were several political forces involved- from the far left to left, to liberals, nationalists, Islamic Marxists, moderate Islamic groups, the left wing of Khomeini's Islamic Republic Party and the right wing of his party. In the course of two years, gradually the right wing of Khomeini's party gained power and then a massive purge of all the other forces began. This purge included the execution of moderate Moslems and even the left wing of Khomeini's party. Many revolutionary guards and Moslem students who fought for the revolution were executed and Khomeini approved this purge. So this wasn't a Shiite revolution at first. It was a massive revolution against the 2500 year monarchy in Iran. People wanted a republic, a democratic and independent government free from imperialist intervention. In my first novel, At the Wall of the Almighty, I dealt with the revolution and all the forces that were involved in it. Of course the way a novelist deals with political matters is very different from the way a sociologist would write about such events. Through magical realism, surrealism and stories within stories I've told the tale of the revolution. But The Bathhouse is a novella. The shorter the work of fiction is the more focus is on the main character. In The Bathhouse the form required an intense attention to the predicaments of the protagonist. I didn't intend to analyze the revolution here I'd done this in my longer work. 7. How can readers become more informed about Iran? What books, films, websites, or other sources of knowledge would you recommend?